UPDATED: Who Said Local Elections Aren’t Interesting — T/E School District Region 2 Candidate is Also a T/E School District Teacher! How is that Possible?? UPDATE: The following blog post originally appeared on October 12. After posting, I contacted T/E Region District 2 school board candidates Kyle Boyer (D) and Doug Anestad (R) and chair of Tredyffrin Township Democratic Committee Kathleen Keohane, offering to post responses to the post. I received responses from Doug Anestad and Kathleen Keohane and those responses now appear at the end of the post. (See Below). There was no response to my email from school board candidate Kyle Boyer. Based on the colorful campaign yard signs sprouting in our neighborhoods, we know that the countdown to Election Day 2017 is underway. 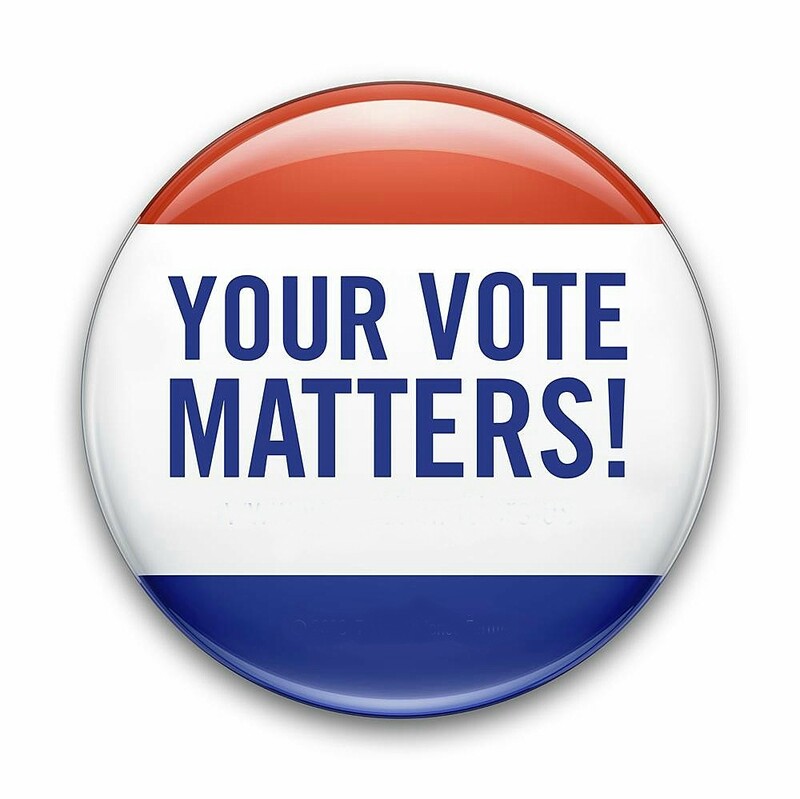 While it should be a given that the the upcoming Municipal Election on November 7 for township supervisors and school board directors is important, we know that historically turnout on a non-presidential year is not good. In an attempt to encourage interest in our local races, I wrote a post earlier this year after the candidates filed their petitions, listing all the supervisor and school board candidates. In that March 8 post, I commented about the T/E Region 2 school board race between Democrat Kyle Boyer and Republican Doug Anestad; asking if a current T/E School District teacher (Boyer) could run for the T/E School Board. Although intended as a “procedural question”, there were a few comments that suggested I was biased in this race because I knew Mr. Boyer’s opponent (Doug Anestad). My point wasn’t to advocate or side with one candidate over another — it was simply seeking an understanding of the situation from a legal/procedural standpoint. I subsequently learned that a candidate (in this case Kyle Boyer) can run for T/E School Board as a T/E School District teacher. The candidacy is not the problem; the difficulty arises should the candidate win the election … as a currently employed District teacher cannot also serve as a member of the District’s school board. However, it was stated in March that Boyer intended to leave the District and work as an administrator in another school district and that his departure would be long before the November election or the 60-day requirement of notification to the District. It was assumed that the situation would resolve itself. Between the Trust’s 13th Annual Historic House Tour in September and a trip to Seattle to see our first grandchild Audrey last week, I have admittedly been distracted from local issues the last several weeks, including the upcoming municipal election. I have now learned that the situation with the T/E Region 2 school board candidate Kyle Boyer has not resolved itself. Mr. Boyer did not resign from his position with the T/E School District and remains in the classroom as a T/E Middle School teacher. The deadline for candidates to withdraw their name from the election was August 8 and Mr. Boyer did not withdraw. 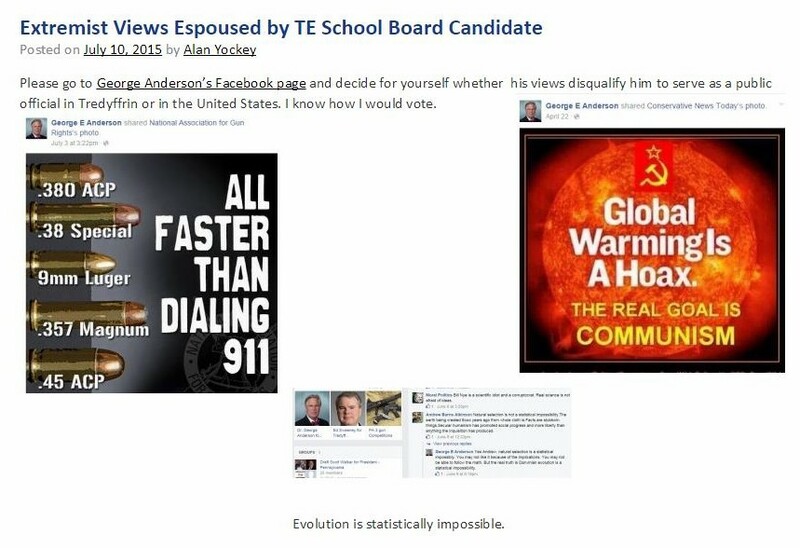 We have a T/E School District teacher with his name on the ballot as a candidate for the T/E School Board yet he cannot serve the District as a member its school board and as a District teacher. Now what?? 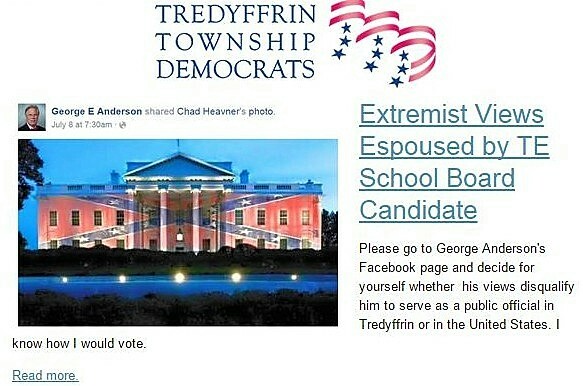 The following email was received from Neill Kling, chair of the Tredyffrin Republican Committee regarding the Kyle Boyer issue, stating “what had been a troubling potential conflict of interest has now become a legal question …” I will contact the chair of the Tredyffrin Township Democrats Kathleen Keohane and T/E School Board Region 2 candidates Kyle Boyer (D) and Doug Anestad (R) for their comments on this matter. If responses are received, the post will be updated accordingly. The local T/E School District Region 2 race just became a lot more interesting! We know that T/E school district employees are forbidden by law from serving on the T/E School Board because that creates an obvious, immediate and irreparable conflict of interest. Nevertheless, one of the candidates for School Board in Region 2, Kyle Boyer, is currently a teacher at Valley Forge Middle School. While this may technically be permitted (so long as he leaves his position in time to serve — see below), it obviously creates a similar conflict of interest, particularly at this moment of District/Teacher contract negotiations. However, I learned over the weekend that Mr. Boyer did not notice his resignation as a teacher in the T/E School District by October 6 and, to my knowledge, still has not done so. That is critical, because, as I understand PA law, a teacher must give 60 days notice of their resignation before it takes effect. I presume that rule is to protect the smooth transition of instruction for the students being deprived of a teacher, and give the district time to identify a proper replacement. In any event, should he be elected School Board Member, Mr. Boyer will not be able to assume the office on December 4, 2017, which is when the new school board sits. Thus, what had been a troubling potential conflict of interest has now become a legal question: is Kyle Boyer eligible to be on the ballot given that he will not be able to serve at the appointed time? And that raises other troublesome questions, such as: 1) By whom would a waiver of the 60-day rule be given and on what basis? 2) Could such a waiver be given conditioned on his election? 3) Is there some deal in the works whereby Mr. Boyer has already been promised such a conditional waiver? 4) Has he asked for one? 5) If Mr. Boyer’s name remains on the ballot and he gets the most votes, but withdraws from the race or is unable to serve, who decides upon the person to serve on the School Board in his stead, and under what criteria? 5) Should the parents of Mr. Boyer’s students have been told what the potential status of his employment is? The PA state law for school directors can be found athttp://www.legis.state.pa.us/WU01/LI/LI/US/HTM/1949/0/0014..HTMunder ARTICLE III. SCHOOL DIRECTORS. The prohibition against an employee serving as school board member is Section 324. The language requiring teachers to give 60 days notice can be found in ARTICLE XI. PROFESSIONAL EMPLOYEES. Section 1121. We are currently looking into these questions but I would appreciate your putting this up on the CM website to generate valuable discussion among community members. It is telling that neither Kyle Boyer nor Kathleen Keohane have responded for four days, and is a clear indication that they don’t have a good explanation. I am sure they will come up with something, but it will not answer the fact that teachers are required by state law to give 60 days notice to resign, or that teachers cannot serve on the school board of the district in which they work. 1) He violates state law and resigns with less than 60 days notice before the December 4th swearing in date. All signs point to the fact that – because he has violated the law and not resigned in time – he cannot serve on school board. 2) He does not resign as a teacher and simply cannot serve on school board. This looks increasingly likely as Mr. Boyer has already missed two important dates this year in regards to resigning. Now, no matter what explanation is provided, it must be noted that Mr. Boyer and his party leaders have already lied to the public about this issue. On March 14, 2017, Kathleen Keohane stated on Community Matters that, “Kyle will have left the District long before the November election or the 60-day requirement.” He has not. If Mr. Boyer were absolutely certain he was going to resign, he would have done so with the proper legally required notice, and in time to be seated on December 4th. Again, he has not. The important phrase there? “During the term for which he was elected.” This means that if Mr. Boyer were to win, he could not teach in T/E for the next four years unless he received special treatment from the board. Nor could he serve for the next four years as he violated the resignation notice requirements. Finally, if Mr. Boyer were to win, he would be taking away the voice of Region 2 residents. Remember: he can’t serve. That means that the remaining school board members choose who would take his spot – some of the same people who ignored our Region 2 community in the past would be the ones to pick our representative. Mr. Boyer’s actions have put residents, the school board and even his students in an untenable position. A position that was avoidable had he and his party leaders just kept their word. But they didn’t. As for me, I will continue to run on my record and background as an active and involved citizen fighting for our schools. For example, after I found out that our region was underrepresented by almost 50%, I pushed for, and got, new boundaries for the voting regions for school board that are equal in population size. I was a voice for our parents and community in the Valley Forge Middle School fence issue. I fought to bring technology education to our middle schools. And, I have helped protect taxpayers by stopping wasteful school spending. If elected, I will continue to do the same. Moving On . 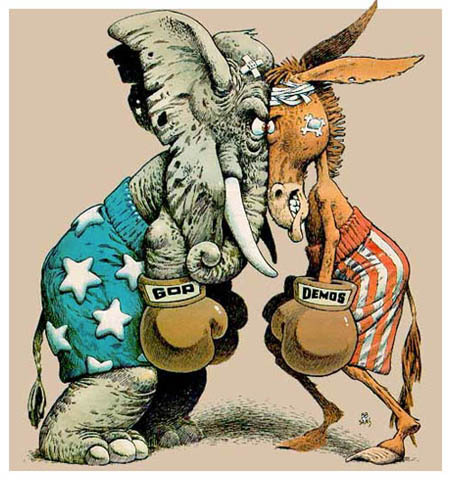 . . Is Partisan Politics in Local Elections our New Reality? This week’s torment from my stance on Community Matters (and its use) came with a personal price tag. I watched helplessly as something that I created and nurtured over the past eighteen months became a political football. Rather than feeling good about taking a stand for justice for Community Matters, and myself, I became the target; my words twisted and misinterpreted. In the words of William Shakespeare, “This above all; to thine own self be true”. That mantra proved particularly difficult to follow this week. Through the sadness and disappointment in some people, I learned some difficult life lessons . . . but, I also learned the meaning of true friendship. 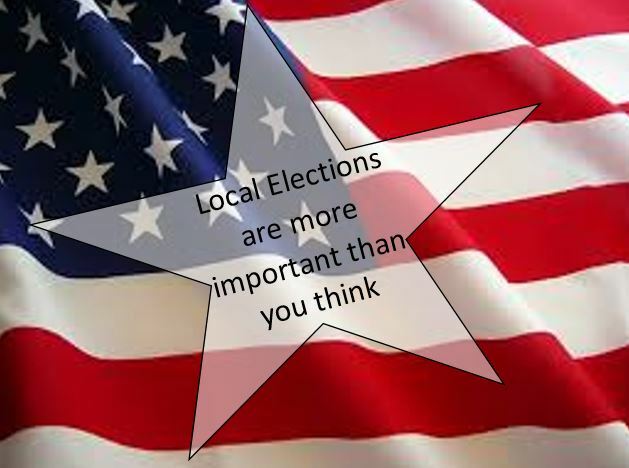 In addition to Primary Election Day on Tuesday, May 17, it is the Special Election to decide which supervisor candidate, Molly Duffy or Mike Heaberg, will fill the unexpired Tredyffrin Township supervisor term left vacant by Warren Kampf’s election to State Representative. Tomorrow I plan to list the special election candidates, school board, board of supervisor and municipal judge candidates. I will make available his or her resumes and encourage everyone to get out and vote. In my perfect world, municipal politics would be free of partisan interests. Those individuals elected to serve, would do so for all the community. The interests of the people would always trump the political party the elected official represents. In my perfect political world. There are, of course, no perfect political worlds, and Tredyffrin Township is no different from the rest. Politics has the ability to bring out either the good or the bad in mankind. The human desire for power, if unchecked, is evil. Evil partisanship can destroy the fabric of a local community. Perhaps more appropriate than the label of ‘Independent’, I guess I would call myself an ‘Idealist’. As an idealist, I lament for a future of local nonpartisan elections, where there will victoriously emerge individuals whose intelligence, integrity, intestinal fortitude, character and non-alliance with special interests are beyond question. I wish for a future where important issues and candidate differences can be fairly discussed and openly debated. In the end, voters will elect whomever they think will do the best job — or at least that’s how they should cast their ballots. But what’s often said about democracy? Despite its obvious faults, it’s the best system of governing. The people, the voters, get to decide who governs them. That will be the final word on partisan politics in local elections, and local government. Senator Andy Dinniman held a small meeting last night to focus on the PA Turnpike stormwater management issues. He brought together turnpike representatives as well as elected officials and individuals representing various homeowner and associated groups in the area. Kathleen Keohane, a resident of the Yellow Springs/Great Valley section of the township attended and graciously provided the following update notes from the meeting. Thank you Kathleen! It was State Senator Andy Dinniman’s idea to bring decision-makers from the Turnpike Commission together with representatives of the Township and Tredyffrin‘s civic, neighborhood and environmental groups to discuss the Turnpike’s revised stormwater management plan. This is one part of the overall 6-mile-long road widening design plan that will also include sound walls along most of the roadway. -Stormwater runoff from the turnpike will be controlled at near 100%, even with the now planned 26 foot median. This represents a significant improvement in volume control since the original stormwater plan was presented; Control rates exceed DEP standards and in almost all cases, meet Tredyffrin Township’s more stringent criteria. – Only 18 properties in Tredyffrin will be affected under the revised plan– with 15 partial ‘takes” and 3 complete acquisitions. Among those three, no homeowner has been forced to sell. This also is a far cry from the original design plan which called for the partial taking of almost 90 properties and the acquisition of 8 homes. The meeting, held in Keene Hall on Tuesday evening, drew about 50 people. As Senator Dinniman pointed out, “The decision-makers are all here” – including PTC’s head, Joe Brimmeier, Head Engineer Frank Kempf and Project Manager, Kevin Scheurich. 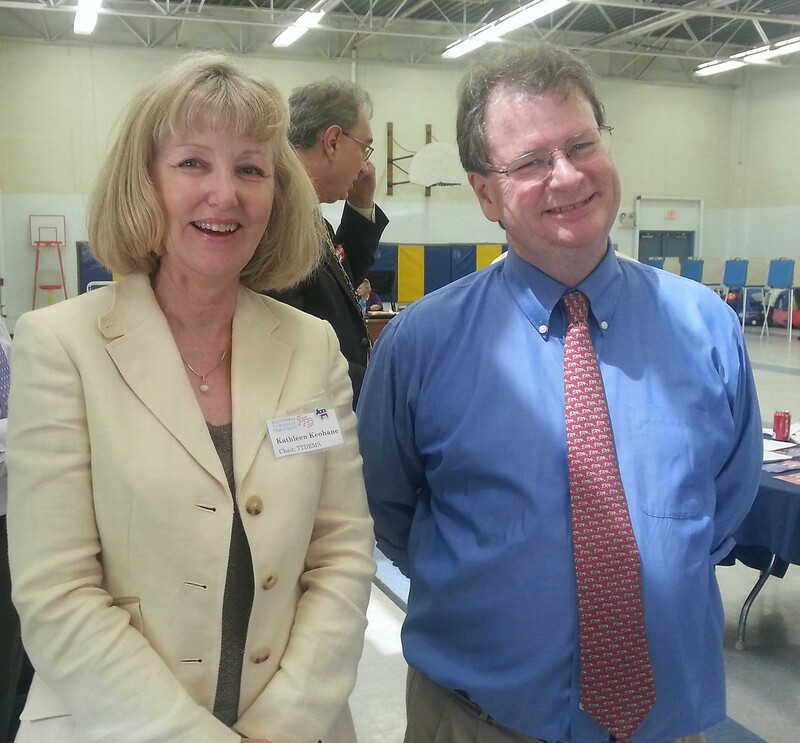 State Rep. Paul Drucker attended, as did Supervisors Di Buonaventuro, Donahue and Richter. Representatives from civic, neighborhood and environmental groups were there, as well as several residents whose properties are being acquired by the Turnpike. Most of the evening’s discussion focused on stormwater problems in the Glenhardie area. This eastern-most section of the 6-mile-long expansion project has proved to be the most challenging given the confluence of roadways, the large amount of impervious cover and the extent of local flooding in heavy rains and damage to Trout Creek. The Township acknowledged that Turnpike runoff is not the only source of the neighborhood’s stormwater problems, and that a “regional” approach will be necessary – one that will involve the Township, PennDOT, commercial property owners as well as the turnpike. While Tredyffrin stormwater expert and engineer Steve Burgo readily agreed that the Turnpike’s stormwater plan had evolved to include greater volume and rate control, he felt there was more that could be done at off-site locations. The acquisition of a small parcel from the Richter property located at the confluence of Old Eagle School, Glenhardie and Walker Roads) was mentioned as was the use of a small piece of land (6.-1 acre in size) at Teegarden Park, near the top of the Trout Creek watershed. Though the Turnpike is willing to listen to alternatives, in their view, they have proposed a viable solution that handles 100% of the turnpike’s runoff in the Glenhardie area. Despite some differences regarding what constitutes adequate stormwater mitigation in this area, a spirit of cooperation seemed genuine and all remaining issues appeared solvable as the meeting wound down. Engineer Pete Goodman, past president of Trout Unlimited and a long-time advocate for maintaining the “exceptional value” of Valley Creek, brought up two areas of concern: that discharges from several of the Turnpike’s proposed detention basins would flow directly into Valley Creek or Wilson’s Run (a tributary) with no volume control. TP Project Manage Scheurich countered that the discharges were not direct in his view and met over 100% of the volume criteria. Both agreed to follow-up with more detailed discussions. Near the end of the meeting, Supervisor DiBuonaventuro questioned the Turnpike’s decision to build a 26 foot median instead of the 16 foot size previously favored. From his perspective as an EMT – and echoing Police Chief Chambers’ position, a wider left-hand shoulder would encourage drivers to use it for emergencies. DiBuonaventuro believed it posed a danger to emergency vehicles coming to a driver’s aid as well as to drivers merging back into the fastest lane of traffic. Engineer Kempf defended the wider shoulder as recommended by the National Transportation Safety Bureau. DiBuonaventuro also raised the issue of additional tree buffer having to be cut down to accommodate the extra 5 feet of roadway needed on each side for a 26- foot median. Kempf acknowledged that some additional trees would need to be cut down but promised to work on a property-by-property basis to determine what had to be cut. He pointed out that residents should be pleased that the Turnpike planned to build retaining walls instead of taking additional private property. He also committed to continue monthly Roundtable meetings throughout the entire construction phase so that residents could express their concerns. Still, as one environmentalist pointed out, building a 26 foot median will require the elimination of 8.2 acres of woods over the length of the expansion in Tredyffrin That’s a lot of trees…..
Another meeting was scheduled for the end of August to continue what proved to be a very informative and useful discussion.